Scottish Cross-Country team, 1949. Craig third from right in the back row. George Craig was the son of Archie ‘Baldie’ Craig of Bellahouston Harriers who had won the national cross-country title in 1913 and five cross-country international vests and the younger brother of Archie, junior, who was a member of Shettleston Harriers and ran for Scotland in the cross-country international in 1938 and 1939. There have been many remarkable family groups in Scottish athletics – Dundee’s Hasketts and Gunstones, Greenock’s Spence brothers and others. No one has had a father and two sons run for Scotland to the best of my knowledge, although the Brown family from Motherwell came close – Andy and brother Alex both represented the country but although father Andy was a very good runner, he never had a Scotland vest. 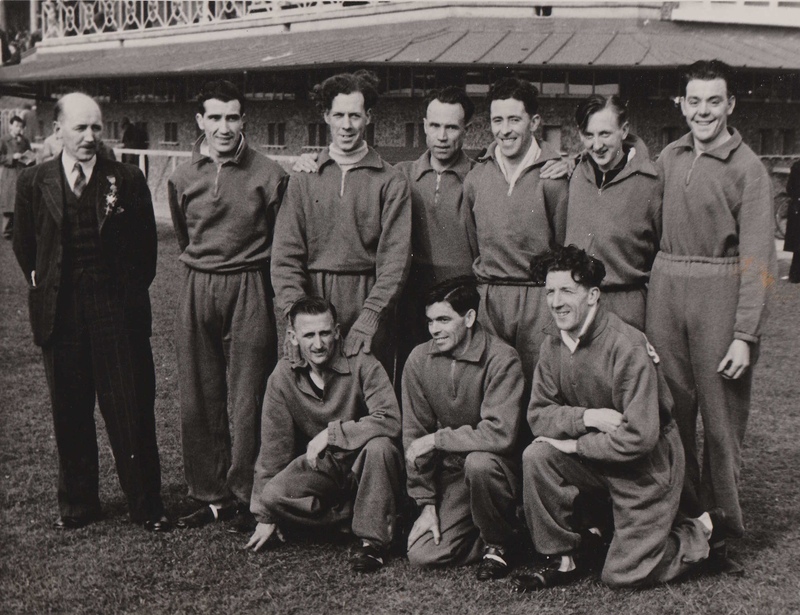 The Shettleston Youths team was second but the following year, when Craig was the only winner from 1935 to retain his Scottish title, they won comfortably from Victoria Park: 17 points to 54. In both seasons – 1934/35 and 1935/36 – he won the club youth cross-country championship. The Shettleston team at the time was very strong and the young Craig was not a counting runner in championship teams for several years. Even the detailed Shettleston Harriers centenary history next mentioned him in season 1938/39 when he won the National Novice Championship at Hamilton Racecourse from more than 300 runners. Missing the national championship in 1939, he ran in the 22nd April 1939 Edinburgh to Glasgow on 22nd April on the third stage (big brother Archie ran second) and was second fastest on his stage with the club in third place. The war started that year and athletics suspended until after the hostilities had ceased. Both brothers served during the war with George in the Royal Welch Fusiliers and Archie was a dispatch rider with the RAF. However when it came to the national, he fought hard and started off well up with the leaders but dropped off the pace and eventually came in in fourteenth place. The team finished fourth. His winning time was 32:17.6 with Alex McLean (0f Bellahouston) second. Into winter 1947/48 and on 4th October the McAndrew Relay at Scotstoun was the first serious race. Craig was on the second stage where he took over outside the first half dozen runners but handed over in the lead with a time of 16:28 – a lead which the team held until the finish. Two weeks later it was the Dundee Kingsway Relay where Shettleston fin ished second to Victoria Park with Craig on the second stage again and this time, although he moved into first place with half a mile to go, he was passed by Mitchell of Edinburgh Southern Harriers. Still with the relays on 6th December, Craig was in the winning team in the Midland District Relay at Motherwell. Running on the second stage he ran the second fastest time for the day, only three seconds behind Bobby Boyd of Clydesdale Harriers. 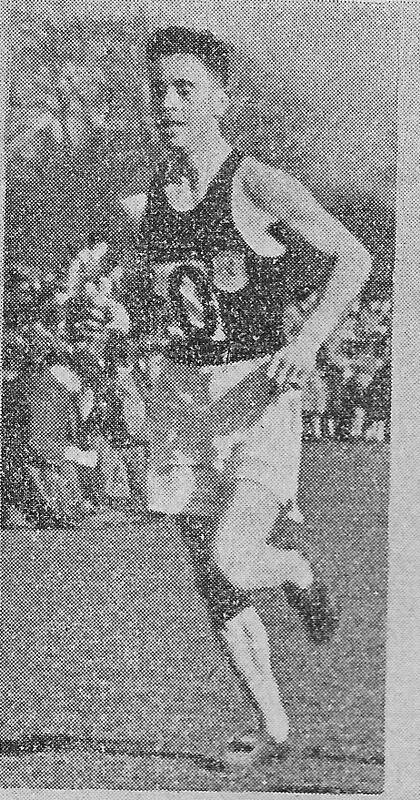 In the Midland Championships on 7th February, 1948, Craig ran well enough to be third behind Boyd of Clydesdale and Lennie of Vale of Leven with his club team in third place. In the National at Hamilton he finished third, and won the Scottish Junior Championship, only 14 seconds behind the winner, JE Farrell. He was selected for the international at Reading on April 3rd. Craig was running so well at this point that he was named by Farrell as a potential Olympic representative for the Games later that year: “Scottish 6 miles track champion, George Craig of Shettleston Harriers, is listed as a “possible” for the 10000 metres. After trying for cross-country honours, George is likely to have a short rest, and then in his own words, ‘have a go at the 6 miles event. Sharp 2 miles for speed are likely to figure in his track schedule.” In the actual international cross-country, Craig was last counter for the Scottish team that finished fifth with his 38 place across the line, one place behind Jim Flockhart. The Tour de Spa invitational cross-country was a very prestigious race at the time and the Scottish contingent was made up of Alex McLean (6th), George Craig (12th) and Jim Flockhart (18th). In the ‘Scots Athlete’ of May 1949, Emmet Farrell remarked that McLean’s performance was a very good one, and that the usual five nations were augmented by Sweden and Czechoslovakia on a trail near the Forest of Ardennes. Two international races in a matter of weeks was valuable experience for the young Scot. Racing with the likes of Flockhart and McLean could not have done him the slightest harm! In the summer of ’48, Craig probably took part in most if not all the two mile team races thatwere available and popular among runners at the time. For instance, on 22nd May at Ibrox in the Bellahouston Harriers Sports, Craig was part of the winning Shettleston team that won the two miles team in which Andy Forbes (VPAAC) was the winner in 9 min 24.9 sec; his own club won their own two mile team race on 7th June at Ibrox, and there were several others at such sports as Gourock and Babcock’s. The result: 1. A McLean 30:54.7; 2. G Craig (Shettlestom H); 3. R McCormack (Lochwinnoch H). After the championships were over the season progressed with several two and three miles individual and team races including such meetings as the Edinburgh Highland Games where there was a handicap three miles, in which his club participated. 1948/49: Craig was not in the first team for the McAndrew Relay at the start of October. The Midland Relay was held at Stirling on 4th December and Shettleston ran out the winners. He did run this time, on the first stage and handed over ‘a nice lead’, having run the sixth fastest time of the day, which his club maintained to the end. Craig also missed the District Championships in the new year too. In the international itself at Baldoyle Racecourse in Dublin, Craig was third Scot to finish when he was 32nd. The Edinburgh to Glasgow that year was in April and of course George was in the team The two stiffest tests in the race were always on the second and sixth stages. This year he was on the sixth stage, the longest in the race at 7 miles, where he turned in the fastest time of the day – 33:01, W Williamson of Greenock Glenpark and Alex McLean of Bellahouston – to keep his team in first place, which is where they finished. On the track, there was another second place to Alex McLean in the Six Miles at the SAAA Championships on 25th June, McLean’s time was 31:04.8. That third medal in three years at the championships was the high spot of the year – at the end of the summer, in his review of that season, Emmet Farrell did not mention either Craig or McLean. It was on to the 1949-50 cross-country challenges. In the McAndrew Relay at Scotstoun on 1st October, Shettleston was second behind Victoria Park but Craig was not in any of the three teams. Nor was he present at Dundee Kingsway where there were two Shettleston teams, the first of which finished second. The Midland District Relay was run on 5th November but Craig was not in either of the club teams. But when the Edinburgh to Glasgow eight stage relay came around on 21st November – the second running in 1949, George Craig was there on the hard, six mile, second stage. He ran the equal second fastest time behind Chic Robertson of Dundee and the team won from Victoria Park. On 4th February when all thoughts were starting to turn to the national championships, he competed in the Midland District championship at Motherwell and was second Shettleston runner home in sixth position for the team that won gold. 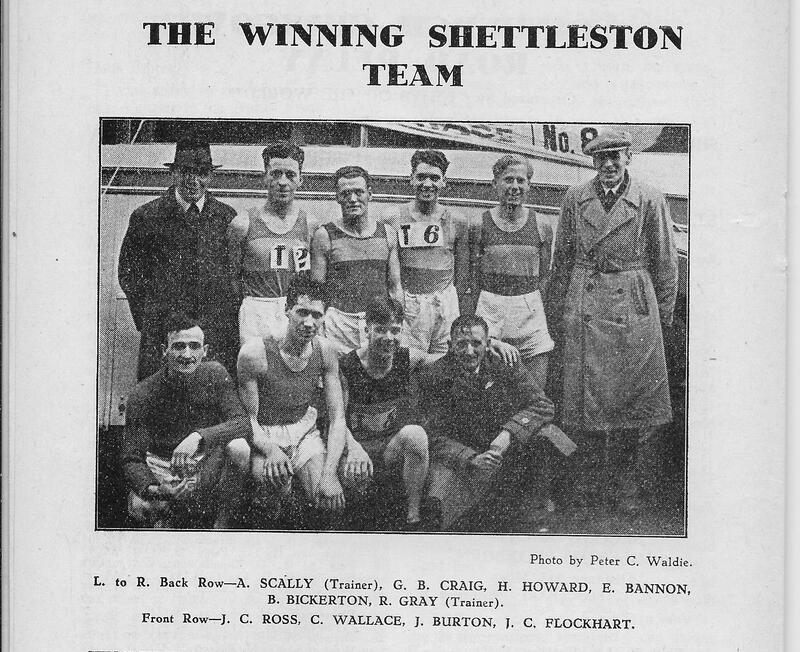 Shettleston won the team race and he was selected for the international. Before that however, the club sent a team to the English national where they were third with Craig leading the team home in 13th position. The others were Bickerton 16th, Flockhart 24th, Wallace 26th, Howard 80th and Ross 83rd. Then it was on to the international. The event was held in Brussels and featured 10 nations – a record number – including newcomers Italy, Holland and Belgium, along with Scotland, England, Ireland, Wales, France, Spain and Switzerland. Craig finished 55th and the team was seventh. That summer was the first for several years that Craig did not contest the six miles at the championships in June, and it was on to the winter season. There had been no indication of illness or injury in the previous year and this year too Craig had a slow start. Farrell mentions twice that I can find that Craig was ‘lightly raced’ and certainly his winter programme never seemed to embrace all the classics every year, and by classics I mean McAndrew relay, Kingsway relay, E-G, Nigel Barge as well as the District and National relays and District and National Championships. In 1950/51 he missed the McAndrew and Kingsway relays which meant that he was in the second team for the Midland relays at Stepps on 4th November. He was fastest in the second team but slower than all of the first team (finished second). This set him up for a good run where, despite missing the start of the season, he was asked to run the sixth stage again. Taking over in first place, he stayed first with third fastest time of the day (34:56) behind Andy Forbes (34:13) and Tommy Tracey (34:38). Johnny Stirling took Victoria Park back into the lead on the last leg to see them win and Shettleston finish second. Craig then missed the Nigel Barge 5 mile road race at Marhill at the very start of January but turned out in the District Championships on 3rd February where he was second club man to finish when he was ninth (Bannon was second) and the team was again second to VPAAC. Emmet Farrell’s preview of the national read “I cannot see Tracey or Craig as serious challengers for the individual title yet I feel that they are reasonably certain of forward places and individual selection. … Craig has been more lightly raced, and strength and reserve can be telling factors in a gruelling race.” Unlike many modern commentators, Emmet was never afraid to nail his colours to the mast and this at times led to judgments that were a bit off in events where the subjective feelings and actions of individuals were involved . As far as Tracey and Craig in 1951 were concerned he was a bit off. After a mix-up at the start where both Forbes and Tracey missed the gun and started behind the field, the race turned out to be between just those two with Forbes getting the win with Tracey runner-up. Craig was down in twelfth place and completely out of the reckoning for international selection. He was again second club man (behind Ben Bickerton) in the team that finished third (VPAAC and Springburn). He had seen his last Scottish international vest. There were to be no more dark blue vests for the Craig family. He ran well enough in 1951/52 to be Shettleston Club Cross-Country Champion but he never again appeared in any championship race, missing all District and National relays and championships. What was the story? Well, Emmet Farrell in his preview of the 1952 national commented that “There is a whisper that George Craig, who threatened retiral last season, and is at present residing in Ireland, has resumed the sport and if this is correct and he enters – well, George would still have to be watched.” It would seem that the whisper was inaccurate for George did not compete again in Scotland. It had been a short career but an excellent one, if falling slightly short of the brilliance that it had once promised but one of which he can be proud.